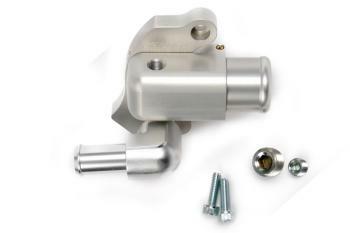 K-Tuned Upper Coolant Housing - TRU Motorsports International LLC - Your Car and Truck Headquarters! Here is the K-Tuned Upper Coolant Housing. With applications for both K20 and K24 engines, these housings will provide several unique advantages over the stock units. The hose outlet on the K-Tuned housing pivots slightly, allowing approximately 15 degrees of angle adjustment. This is helpful when compared to the fixed the factory outlet that always seems to put the upper rad hose in the path of the intake piping. There are three available hose outlets to work with any radiator hose setup. Choose the standard 1.25” rad hose outlet for use with regular rubber or silicone rad hoses. Switch to our optional 12AN or 16AN fittings for use with upgraded hose and fittings that are also available from K-Tuned. We have also designed an optional Filler Neck that can be used to relocate the radiator cap to a higher point on the engine itself. The new location is the highest point of the cooling system and allows air pockets to easily escape during the coolant bleeding process. The optional Filler Neck is also available with standard 1.25” hose or in 12AN and 16AN sizes and was designed for use with an OEM 92-00 Honda Civic radiator cap. This part will be very helpful on an engine that already has a bad reputation for coolant bleeding.